The North American Open were for many years one of the most famous Darts tournaments in the USA in which a lot of international players took part as well. The members of the SCDA finally decided to sue the annual membership fees to finance the price money and invested numerous hours in all the preparations like producing nine double sided oches and to announce the tournament all over the USA. One of the problems they had to fight was that "English Style Darts" at this time was not really known in the USA. One had to explain the rules first and how the board and the darts looked. At this time in America when darts was played at all "American Style Darts" was played. In August 1970 in Culver City the inaugural North American Open was played. 250 players from four states(California, Oregon, Pennsylvania and New Jersey) took part among them the at this time famous players from Philadelphia which were known as the best players of "American Style Darts" and who in the end won the team competition. Della Fleetwood, wife of Tom Fleetwood the founder of the ADO (American Darts Organisation and one of the founders of the NAODT) has collected a lot of details about the tournament. So one can read that during the tournament which lasted fours days and had four events, 5000 bottles of bees and 28 crates with other alcohol (most probably whisky) were consumed. The tournament closed with a small deficit but was overall thought as a big success. So the organiser started immediately to plan for the next year. Over the years the numbers of participants increased, Canadian players supported the tournament as well so after three years one had to search for a bigger venue. Two years one played in the Disneyland Convention Centre which attracted the first British participants. The venue changed quite a lot over the years - from the Disneyland Convention Centre to the ship Queen Mary and then to different hotels in Las Vegas. The number of participants levelled out between 1800 and 2100 from around 17 countries. In 1999 the tournament was organised for the last time by Della and Tom Fleetwood. Accudarts, sponsor since 1998, in the following year bought the tournament - probably because of Tom Fleetwood's health issues - and PDC organised it. Then the PDC took over completely and the tournament was played as "Las Vegas Desert Classics" till 2009. But it now was a tournament for only 32 players - the top 16 of the PDC Order of Merit and 16 qualifiers. All American players had to play through the qualification first which was not easy as a lot of PDC players always took part as well. The Americans never really warmed to the PDC tournament - certainly one of the reasons the tournament ceased in 2009. From the beginning the NAODT consisted of men's and ladies singles, men's doubles and a team event. 1975 mixed doubles were added, ladies doubles in 1983. In 1984 the team contest was scrapped and men's and ladies cricket doubles played instead. 1998 men's and ladies singles cricket were added. The mixed doubles were taken over by mixed triples which were played till 1997. The singles format from the beginning was 301 double-in double-out. Under the winners of the North American Open all the top nobs of the time can be found. The most successful lady was Stacy Bromberg who won the singles six times and together with Lori Verrier the doubles eight times, four times Kathy Malony won the singles, three times Maureen Flowers from England. The most successful man was Eric Bristow with four singles titles, two titles got beside Englishmen John Lowe and Phil Taylor a number of American players as well for example Roger Carter, John Kramer and Steve Brown. 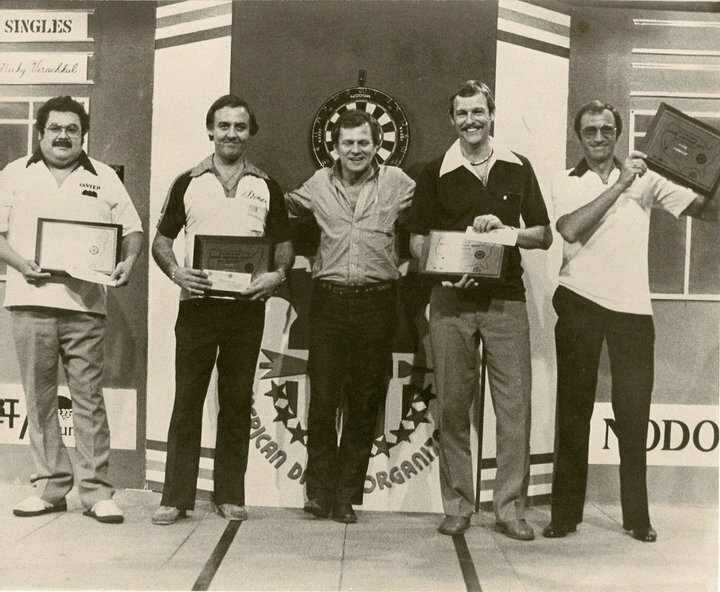 The most successful men's double was John Lowe/Cliff Lazarenko with three titles. Perfect matches - in this case 6-darters were not really common. Ronnie Baxter was the only player managed twice in 1989 und 1993. But even more remarkable was the first player who ever threw a six-darter during the NAODT, Kevin Haynes, as he followed his inaugural perfect match during the men's singles in 1982 with a second one in his next match. Kathy Malony got four times the "most valuable player" award, Stacy Bromberg got it three times and Eric Bristow and Ronnie Baxter were the only men who got it twice though Ronnie Baxter never won a single title. Stacy Bromberg won the most titles followed by John Lowe and Lori Verrier. From 1980 L. David Irete filmed all stage finals for Triple Twenty Productions. It's a pity you can't find them in the internet. Picture 1 with kind permission from Anne Kramer. 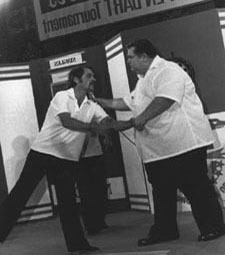 The picture shows John Kramer (left) and Tom Fleetwood after Kramer's win of the men's singles in 1981. Picture 2 with kind permission from Bob Anderson. On the pictures you can see the winners of the 4 Men Team Event in 1992. From left to right: Javier Gospar,Dennis Hassett, actor Ken Kerchival, Bob Anderson and Anthony Jenkinson.